Will Your Town Celebrate Bike Month with a Proclamation? One of the 3 racks at Spokane City Hall that fill up when advocates appear before City Council. 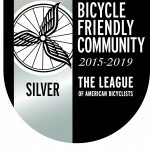 Want your city or county to be recognized for its bike-friendly qualities in the nation’s #1 Bike-Friendly State? 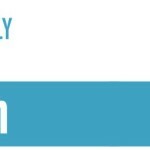 How about a quick way to determine which local elected officials are bike-friendly or to give a few moments of publicity to someone you already knew makes a great ally? Ask them to sponsor a Bike Month proclamation. Step 1) Download or copy our sample proclamation. Step 2) Tailor it with the names of your local bike group, May Bike Month activities, supporters and partners who appreciate the value of bicycling for your community’s quality of life, health, and economy, and anything else that captures the unique experience of bicycling in your community. Step 3): Take the proclamation to your mayor, city council, and/or county leadership and ask them to adopt it. Step 4) Don’t forget to tell your friends on Facebook and alert the local media when a group of people on bikes plan to show up at a City Council meeting for a celebration of biking. You want those elected officials to be recognized and appreciated for their support. Step 5) Come back and drop a link here to the local media coverage, minutes of the City Council, and what-have-you; tweet the link and tag us at @WAbikes; post it on our Facebook page; and email us. 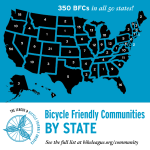 We’ll shout out every town, city, and county in Washington that wants the positive reputation that goes with supporting and celebrating bicycling and add to the applause and acclaim. What Makes a Bicycle Friendly Community in Washington State? 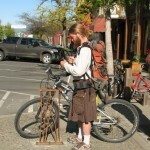 This article was posted in Advocacy, Issues & Advocacy and tagged bike month. Bookmark the permalink. Follow comments with the RSS feed for this post. Both comments and trackbacks are closed.